So I tossed it all up, and created a salad insane!" Heat a non-stick pan. Add the oil and chili. Saute till the chili begins to sizzle slightly. Stir in the panch phoron mix and ginger and cook for a quick minute on medium heat, ensuring the spices don't burn. They will become fragrant and you'll know when they're roasted. Now add the grapes, water, lemon zest, lemon juice, sugar, paprika and salt. Raise the flame to medium-high and bring to a boil. Let it cook uncovered for 20-25 minutes, till the grapes are tender & the liquid begins to thicken. Crush some of the grapes with a back of a spatula and mix well. The more sugar you add, the thicker the consistency. However, grapes are already pretty sweet so I keep the sweetener on the low side. Cook till the chutney reaches a coating consistency, so it can stick to the beets. Remove from heat & cool to room temperature (it will thicken further once it cools). Notes: The chutney also tastes great with baked chicken, white fish, smeared on crisps, toasties or poppadams! Can be made a day or two ahead and stored refrigerated in an airtight container. 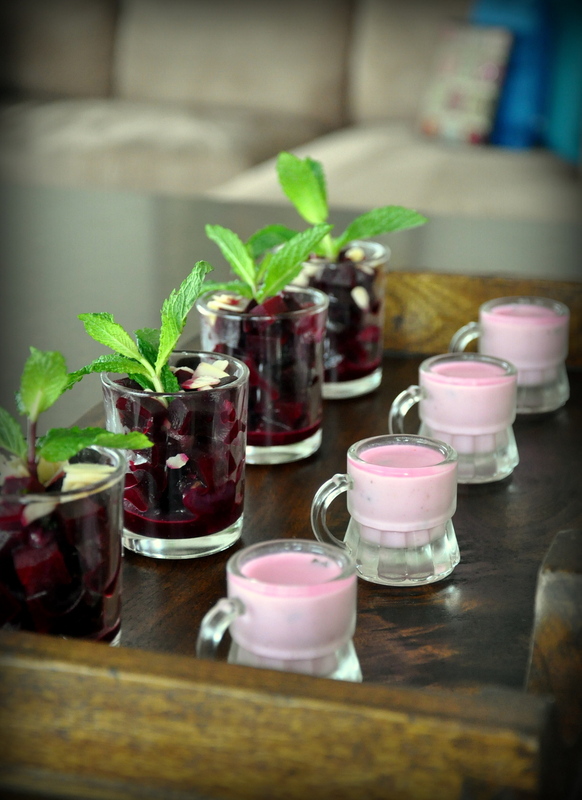 When ready to serve, toss the beets with 2 tablespoons of the chutney, mint, vinegar, lemon juice & rock salt. Garnish with crunchy almonds & serve fresh. A vegan, gluten-free and pretty darn healthy salad with all the colorful goodness of beets, and sweet n spicy flavors from the grape chutney. 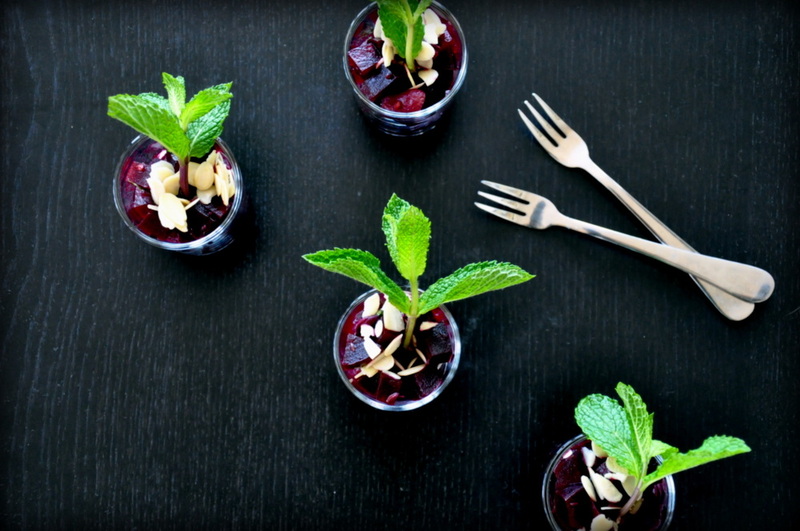 For a recent event, I paired this with savory beet colored yogurt shots for some added adventure!